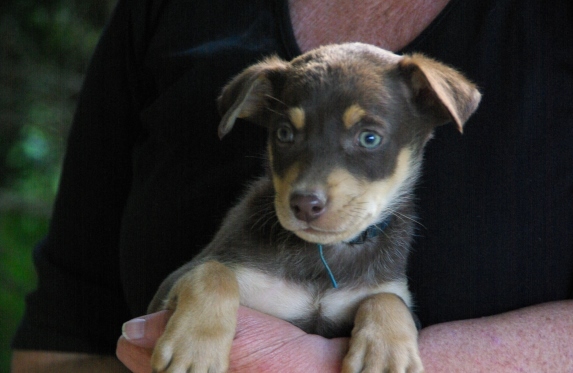 Due to our reputation as one of Australia's leading Kelpie breeding Studs, many of these Noonbarra Kelpie puppy litters have early bookings. If you are interested in any of our Kelpie puppies from any litter please let us know as soon as possible and we can tell you if the gender, colour & suitability of a pup in that particular litter is still available. Due to their popularity there is often a waiting period so please book early. 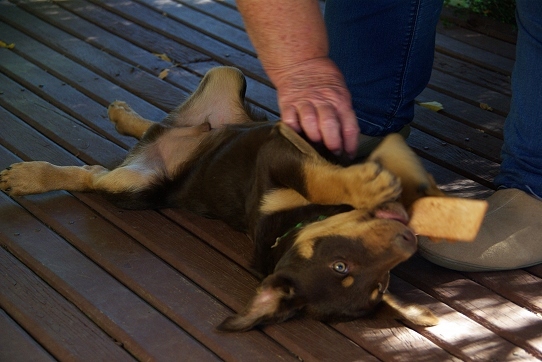 All our Australian Kelpie puppies bred at the Noonbarra Kelpie Stud get the very best in individual attention, handling, socialising and training. Important too are diet and health issues such as regular worming at 2 weeks, 4 weeks, 6 weeks and 8 weeks of age, vaccinations including Parvo Virus, Distemper, Hepatitis and veterinary examination of each pup. Each puppy is also Microchipped. Some years we only breed a very small number of puppies and often we have months without any puppies, so bookings are extremely important. We still like to keep it as an all family run Stud. The Bilson family has been involved in breeding & training Kelpies for just over 100 years and over many decades of breeding with three generations of our family, we have bred thousands of high class Kelpies over the last century and this puts us in a unique position that very few breeders can lay claim to. Our Noonbarra Kelpie bloodlines are highly regarded throughout Australia and around the World and our dogs today trace strongly back to the great Kalari Basil and Kalari Joker (with more infusions than any other bloodline in Australia) and then the lines trace directly further back to the legendary Coil and to all of the very first great Kelpies of the mid 1800's. 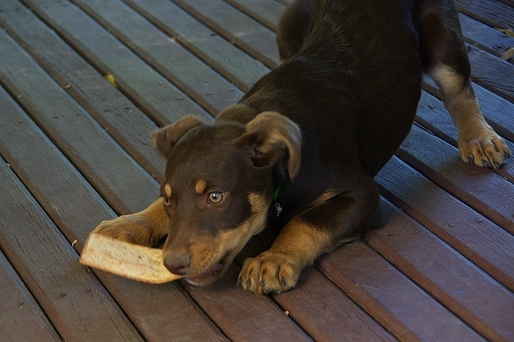 All our Kelpie puppies are guaranteed 100% to work by 8 months of age. (WKC Guarantee plus health guarantee). Please always book ahead as there is often a waiting period to get one of our Noonbarra Kelpies. You must book with a $150 deposit if you are serious about getting one of our puppies. See information on deposits below. All our Kelpies are registered with the Working Kelpie Council of Australia. 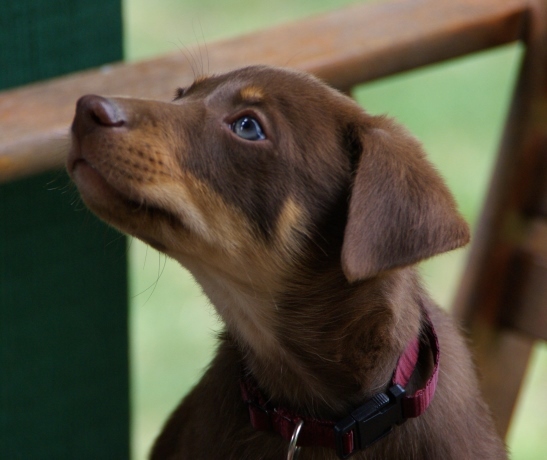 INFORMATION ABOUT BOOKING A KELPIE PUPPY AND DEPOSITS. These matings are expected to be done sometime over the next few months. We expect to have no litters after April/May until early 2020. ORDERS (Bookings) NOW BEING TAKEN FOR NOONBARRA PUPPIES FOR MAY 2019. No more pups after May until early 2020. 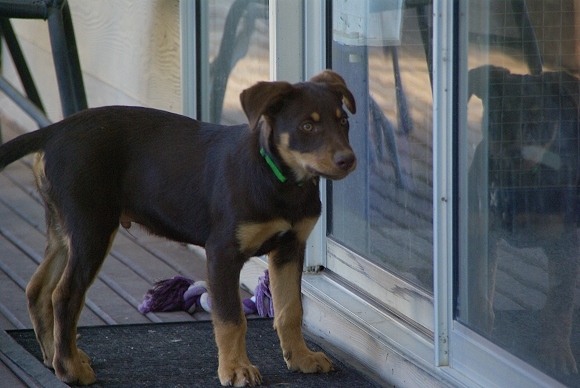 KELPIE PUPPY - Red & Tan Male. We have just made this puppy available. He is 12 weeks old so has had a bit of additional training and handling which puts him on the right track to being an absolute wonderful adult dog. He has had a lot of crate training and car travel too. He also has had his 2nd official set of vaccinations. He doesn't have a name yet so customer can pick one. He will grow to be a medium sized adult. He is a very friendly and happy dog. He sleeps overnight in his crate and is well behaved in the house. This is a more laid back, gentle type of Kelpie which we are renowned for. However, like all puppies he will have his moments. He loves to play with toys and is very affectionate. If he's not out running with the motorbike on farm, he's just as happy lying on the lounge with you watching TV. We like this puppy a lot. He would make a great companion dog. Like most of our Noonbarra Kelpies, he wants to be with you and involved with whatever you are doing. He has such a wonderful temperament. Easy going and playful but also calm and able to settle well. He adapts to new situations well and you can take him anywhere. As he is not too independent he would make a very nice running companion as well. He loves to be patted and will be a loyal, faithful friend. He'd be a perfect dog for a young family and should be good around other animals too. He has had limited exposure to young children and has been excellent. 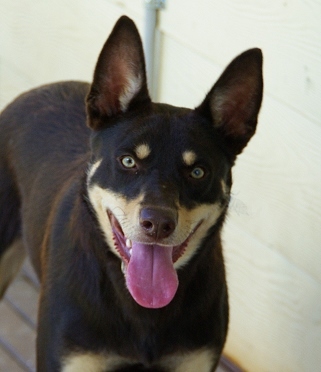 If you want a wonderful young Kelpie with great breeding and a easy going personality then this pup may be just what you are looking for. He's not too excitable but still loves a good play. He has a great sense of fun and really likes his toys and chews but will often drop them to come for a pat. He is very clever and can learn new things very quickly. He'd be a good choice for Dog Sports too. Many of our dogs in the past have gone on to do well in Agility Trials, both here and overseas. He has all the qualities to do well too if that is something you are interested in pursuing. He would be a wonderful dog for sheepwork as well. He's probably not hard enough for aggressive cattle work but would after basic training, be a nice calm worker on Merino sheep. He has some fantastic breeding behind him. He's a happy, friendly puppy and has a nice personality. He is the sort of dog that loves a cuddle and a pat. He has also had his 2nd set of vaccinations so he's ready to go everywhere with you. He's very playful and lots of fun. We take our breeding program very seriously and over many decades of professional breeding we have a huge practical and first-hand knowledge base about these bloodlines going back many generations and that combined with detailed pedigree information, related litters and our detailed evaluation sessions means that each customer gets the very best puppy to suit them in terms of behaviour, personality and abilities. He has had some basic puppy training as well as lots of crate training, so he will be able to be crated at night. (see our info on crate training benefits). Price include all vaccinations against serious dog diseases, Parvo/Distemper and Hepatitis. He has been carefully checked over by Vet. He has also been Microchipped. He has also been on a complete program of worming. Comes with written pedigree and papers. Registration with W.K.C. in National Stud Book for Purebred Working Kelpies. 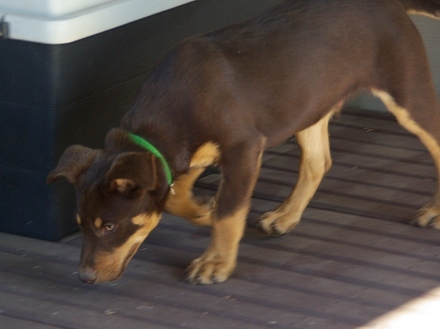 He also has a Noonbarra Dog folder and Kelpie information, photos and other information. So you are getting a very special little dog. So if interested contact us as soon as possible. If you email make sure you leave a phone number so we can get back to you as quickly as possible. He will be very handsome when he grows up. This is our last litter for this year and we already have a number of bookings. Dave is our youngest sire and has been extremely popular with customers. He is producing some exceptional pups for us and we have already kept a son of his for the future (Noonbarra Ben). Dave's dad is Noonbarra Boss who already made his mark as a top level sire for us in the past. Dave is very friendly and a happy easy going type of dog. He has a great sense of play and is very affectionate and faithful. He was well behaved right from a little puppy and has such a zest for life. A nice, loving dog who loves to be around you. He can be fast and agile, or calm and settled. Qualities that we value highly. We think Dave is a handsome Kelpie and he often gets comments when we take him into town. People love patting him. Dave was so easy to train and is the type of dog that wants to please. He is also a very clever dog. He travels well in a car and makes a first class companion dog. He works on sheep very nicely and can handle stubborn sheep. Good presence in the stockyards. Lovely point of balance and will come in when needed. Good work taking sheep off rails, fences etc. Loves running with the Ag bike and gets along with other dogs. He's a great dog in the house and settles well. Usually curls up in a dog bed or on the lounge. We also take him into town every now and then and he is perfectly behaved at cafes etc. In the car you wouldn't even know he was there. He has that loyal, faithful nature that we like in all our dogs and gets along with other dogs and animals. This is Teena's first litter. She's been a fantastic mother to her pups and we couldn't be more pleased. Teena is a happy, friendly girl and is very affectionate, which is one of the traits we breed for. She's very intelligent and learns quickly. She's a wonderful companion and friend. We want each puppy to be the best possible match for their lifestyle and situation. Firstly we work out which litter would best suit and than we do a lot of evaluating of each individual puppy. So, for example, we would match a different dog to a retired couple who are home 24/7 than we would for a young bloke who is very active and needs a running partner or for someone doing dog sports or maybe someone needing a strong willed cattle worker compared to someone with three little kids looking for a soft natured affectionate family dog. All our pups get the best start to life here at the Noonbarra Stud. We think happy, healthy puppies are more likely to be easier to train, are better bonded to their owners and it helps to make them happy, well adjusted adults. We even have a basic puppy training program which includes socialising, exposure to noise, car travel and the beginnings of learning good manners and basic obedience. It also includes (very importantly) comprehensive day by day crate training sessions for each puppy. This is an incredible advantage for our customers. There is a page outlining this training on our website and much more detailed information in our book 'Kelpie Basics'. Click here for more about crate training. Early socialising and handling of puppies makes it all so much easier for our customers. We often have a puppy or two in side on the lounge with us at night watching TV. Our mothers have the highest degree of nutrition when pregnant and after they whelp, so pups are very healthy and Mum is easily able to look after them with no stress. We handle each puppy day by day, so they get used to human touch and we start to supplemental feed the puppies at 3 weeks of age. They also undergo a full worming program with a Veterinary supplied Fenbendazole based medication, all are carefully checked over by a Vet and each puppy is microchipped and vaccinated against major diseases, so you get the healthiest pup possible. They are well socialised right from the start and that makes them so much easier to handle and train for our customers. It also gives each puppy a strong connection to humans and makes them more affectionate and helps to build a better bond between you. Price include all vaccinations against serious dog diseases, Parvo/Distemper and Hepatitis. These puppies will also be Microchipped. They have been Vet checked, given regular worming, registration with W.K.C. in National Stud Book for Purebred Working Kelpies, also have a Noonbarra Dog folder and Kelpie information. Also included is all basic puppy training and handling to get your pup off to a great start. This includes extensive crate training. Early socialising and handling of puppies makes it all so much easier for our customers. We often have a puppy or two inside on the lounge with us at night watching TV. Our mothers have the highest degree of nutrition when pregnant and also after whelping, so pups are very healthy and Mum is easily able to look after them with no stress. Red & Tan Male. 10 weeks old. Available now. We also have just put this beautiful little puppy up for sale. He is just 10 weeks old and has already had a lot of crate training so that makes things much easier for the new owner. We prefer our customers to pick a name, so at the moment he doesn't have one. He will be small/medium when grown and has a great personality. He's active enough to be ideal for dog sports or a running/hiking companion. He is always so happy when he gets to play with us and is very friendly and outgoing. 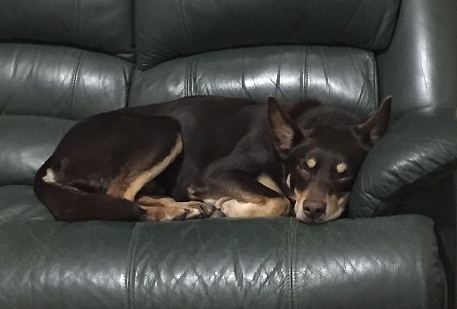 If you want a wonderful Kelpie puppy with some of the best breeding in Australia and a beautiful personality then this puppy will fit the bill perfectly. He's very friendly and interested in everything that is happening. Loves being around us and comes running with tail wagging when you call. He has a great nature, friendly and active but not too over-excitable. He really loves a pat. We tend to specialise in Kelpies that are a bit easier to train and not too intense and very connected to their owners. These dogs have affectionate natures and are good around children. He would make a great companion dog for a young Jackaroo or Jillaroo. Would be perfect on a hobby farm or as a family companion. You won't find a better nature. Excellent bloodlines and wonderful inherited working traits. He would be good with most livestock and has the right genetics for stockyard work and backing. We have a wonderful little puppy ready to go to his new home. He is a very happy, playful little fellow and very affectionate. He doesn't have a name yet so customer can pick one. If you want a very special little puppy with great breeding and a fantastic personality then this little man may be just what you are looking for. He has one of those lovely lighter coloured faces that gives him a friendly soft look. He really looks a lot bigger and older in the photos but he is only 10 weeks old. A lot of Kelpies these days tend to be too big but this puppy goes back on some very old bloodlines and will be a nice medium sized dog. He is very playful but not too over-excitable. This is a gentler type of Kelpie which we are renowned for. He has a great personality and is a very happy dog. He's a real character and has a lot of fun playing with his toys. He loves to be up on the lounge to watch TV with us. He has even been out helping Stephen on the farm. He adapts to new things easily. This puppy is very, very intelligent and can learn almost anything you teach him. You will be amazed at how clever he is. He would make a great companion dog. Would also be a good choice for someone interested in doing dog sports such as Agility or as a running companion etc. Excellent bloodlines and wonderful inherited working traits. With basic training, he would be a wonderful calm worker on livestock and perfect for Merino sheep. He's a good looking little puppy and will look even more handsome when his ears come up. He has some fantastic breeding behind him. He's a happy, friendly puppy and has a nice personality. He's very intelligent and learns things very quickly. He is the sort of dog that wants to be with you and involved with whatever is going on. He loves a cuddle and a pat. Playful, happy natured little puppy. Good in the car and would make a fantastic companion for a family or single owner. This is our very popular manual designed for all Kelpie owners of every level from raw beginners through to experienced trainers. 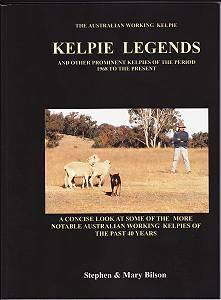 This practical Kelpie manual deals with everything involved in owning and training a Kelpie to ensure he grows up to be a well mannered, obedient dog. 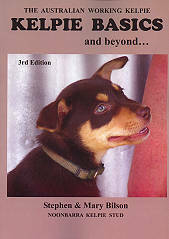 The book is not about how to train Kelpies on sheep or cattle but this foundation training is important for all dogs! 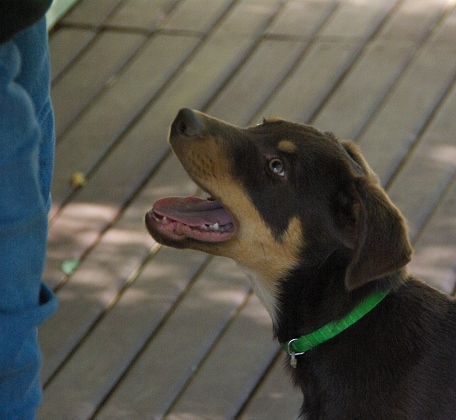 It deals with general obedience training, socialising your Kelpie, feeding, crating, toilet training, preventing problem behaviour in your Kelpie, dominance issues, understanding your Kelpie, Kelpies and car travel, bathing, digging holes, stealing food, walking your Kelpie on a lead, coming when called... and much more. Over 100 large pages of information. Prices listed here for Kelpie puppies are for 8 week old pups only. Pricing for our Noonbarra Stud Kelpie puppies ranges from $1200 to $1500. We prefer our puppies to go to their new homes at 8 weeks. This is absolutely the very best age to get a puppy. If you need us to hold a pup for you longer than the standard 8 weeks, we charge an additional $100 to hold one week. We can only do this when we have enough time to be able to devote to the puppy. The period from 8 weeks is the most important in a pups life. We do not hold puppies more than 9 weeks of age. If you cannot take a puppy at 8 - 9 weeks of age then let us know within 24 hrs of us notifying you of a puppy and we can cancel that booking and look at a future litter. If you do not notify us then you will forfeit your deposit. IMPORTANT: You must make a booking to be considered for a puppy from an upcoming litter. We get many hundreds of calls and emails. A deposit separates the customers who are really serious about getting a Noonbarra puppy. Deposits are $150. Once we have your deposit, you go on a special list that we continually refer to in order to match you to a great little puppy. We discuss your needs and your lifestyle and try to get you a 'perfect' match. Along with your deposit please send as much detail as possible and a phone number to discuss it with you in more detail. Deposits can be paid with Paypal, Personal Cheque (Aust only), Cash, Direct Deposit, Money Order. Let us know as soon as you have made a payment as in some cases we are not informed by bank and we want to get your booking signed in as quickly as possible so you don't miss out. St George Bank Head Office is St. George House 4-16 Montgomery Street, Kogarah. New South Wales, 2217. Australia. 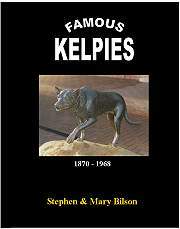 Information on famous and extraordinary Kelpie legends from 1968 to the present.